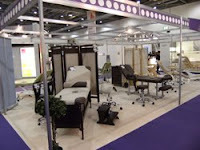 Beautelle’s new Equipment furniture collection was a huge hit at Professional Beauty and Professional Spa last week. 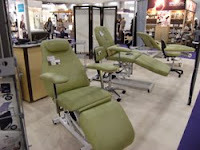 The company exhibited a broad spectrum of new products taken from their extensive portfolio. The new season’s colours were also revealed and made for a show stopping display of olive greens, warm browns and barley creams. Visitors were able to have new state of the art equipment personally demonstrated to them and order bespoke couches and equipment to their own particular specifications. Beautelle’s Sales & Marketing Director comments “over the prestigious three day event we enjoyed meeting our clientele and discussing their individual requirements ‘face to face’. We attracted a broad spectrum customers including Spa & Hotel Retreats;Salon & Therapy Centres;Sports and Leisure Professionals;Sole Trader Therapists plus many overseas Premier Spa clients. Customers were particularly attracted to buy Beautelle equipment because it is British made and can be tailored to the customers own dimensions and colour schemes”. 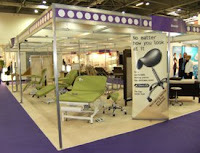 Most popular products on the Beautelle stand were the Helmsley High Specification Massage Plinths with their unique electronic ‘hands free’ foot- rail height adjustment system. Rich dark wood natural spa benches with co-ordinating wood trolleys, screens and steps together with poolside relaxers proved of interest to the Spa Clientele requiring a sophisticated furnished look. Excellent value for money, Buckingham Electric Couches and Hydraulic Tables proved a hit with customers purchasing a quantity of couches for a salon or treatment centre and the much favoured Chatsworth Therapy Treatment Chairs were again chosen for their versatility providing an excellent ‘all round’ solution for small treatment rooms. Popular for their bespoke finish option were Beautelle’s collection of Salon and Spa Trolleys that can be manufactured in a variety of colour-ways, Black and Barley-Cream colours being the most favoured trolley finishes ordered at the show.